The Edmonton Waste Management Centre is North America’s largest collection of highly-advanced, sustainable waste processing and research facilities. Edmonton was one of the first North American cities to launch a curbside recycling program in 1988. The program has a voluntary participation rate of 89%. The City has developed a unique program called Capital City Clean Up, aimed at reducing and preventing litter and graffiti and making Edmonton a cleaner, safer, and more livable city. By composting organics, the Waste Management Branch has reduced more than 700,000 tonnes of greenhouse gas emissions from landfill. Edmonton is a world leader in wastewater recycling. The Gold Bar Wastewater Treatment Plant can supply up to fifteen million litres a day of high-quality treated water to industry, reducing the need to draw water from the North Saskatchewan River. In 1981, a volunteer organization called the Edmonton Gleaners started the first food bank in Canada in order to share and redistribute food resources in the community. 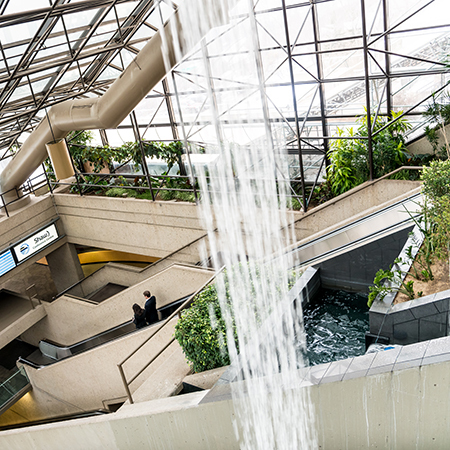 At the Edmonton Convention Centre, we share the City of Edmonton’s commitment to environmental, economic, social and cultural sustainability across the Edmonton Region. We have a duty to Alberta’s legacy as a clean energy leader, as well as a commitment to help sustain a growing community filled with great vigor and vitality, one that needs support in order to continue its unprecedented growth. Conference Sustainability This spring we hosted the Federation of Canadian Municipalities Annual Conference (FCM) . This was one of our largest conferences to date, and our most sustainable one. We achieved many milestones including an incredible 79.3% waste diversion rate. We’re always looking for ways to work with clients and guests to achieve event sustainability, check out how we do it! Interested in seeing how we’re doing? Check out our 2015 Sustainability Report Card and read more about our sustainability story. We’re located on Jasper Avenue in the heart of Edmonton’s vibrant downtown and overlooking the beautiful river valley. Edmonton’s river valley is the largest urban parkland in North America. It spans 7,400 hectares of land and includes 160 kilometers of well-maintained multi-use trails, featuring amazing biodiversity. Given our stunning natural surroundings, we embrace a unique responsibility to help protect the environment. As the world celebrates Earth Day, we encourage you to think about how you can reduce your own environmental footprint. Any action, big or small, can make an impact. "My husband and I could not have been happier with the choice we made with this beautiful venue overlooking the river valley. From the authentic Indian food to the beautiful layout of the venue, our family and guests loved it all! I could not have asked for anything more. Our reception night was perfect. Thanks to the awesome team at the Edmonton Convention Centre for making our special day so memorable."